Small ruminant production is the main source of income of farmers living in the arid and semiarid Mediterranean regions. However, the development of this sector is constrained by numerous environmental, institutional, social and economical factors. These areas are characterized by low and erratic rainfall resulting in water scarcity leading to a low fodder potential. Furthermore, native rangelands are degrading due to overgrazing, high stocking rates and mismanagement. Options to improve small ruminant-based production systems include (1) innovative technologies targeting the increase of feed resources availability, improving diets’ quality and alleviation of feeding cost, (2) organization of local institutions for better adoption of these technologies and to protect the main natural resources (rangelands and water), (3) participatory approaches involving all stakeholders concerned with the improvement of farmer’s income and livelihoods and the better use of natural resources. 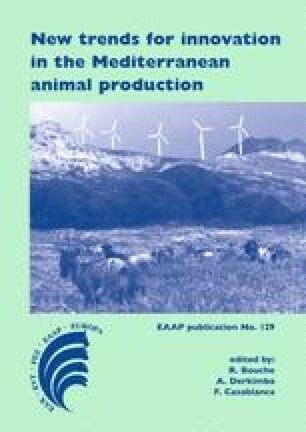 This paper reports on updated knowledge and technologies available to improve the productivty and sustainabilty of production systems in the Mediterranean arid and semi-arid regions and discusses the success stories as well as failures of a set of technologies targeting the promotion of small ruminant production in the Mediterranean basin.